A woman sits holding a baby in a queue at a medical clinic in Mogadishu, the violence-hit capital of Somalia, where fighting between government troops and insurgents has displaced hundreds of thousands of people. "His leg is paralysed; maybe because we don't have anything to eat," the young mother says. More than 100 people are waiting in the burning sun. Some will be here for hours, but there is no alternative. The few hospitals in the city are overcrowded, and the remaining civilians have to go to great lengths to find help. The clinic is run by AMISOM, the African Union peace-keeping force in Somalia. "At least we can do something," says Joseph Asea, head of the AMISOM health clinic in Mogadishu. "We have 30 patients now, but when fighting is bad there can easily be 70." An ambulance arrives. A boy with an improvised bandage around his elbow is carried in. The nurse takes it off to reveal a fresh gunshot wound. She treats it with disinfectant. He is lucky to be alive; over the past few weeks, hundreds of people have died in the fighting. The people in the clinic are relatively safe and treatment is still available. "So far, we are able to supply the people with treatment and medicines," Asea said. According to the UN Refugee Agency, UNHCR, at least 96,000 people have been displaced from Mogadishu since the start of the latest fighting on 8 May. Most are in informal camps outside the city, with hardly any access to humanitarian aid. "The situation is deteriorating and the daily rate of displacement is increasing," said Roberta Russo, spokeswoman for UNHCR Somalia. She said the rate of new arrivals this week from Somalia to Kenya "went from an average of 100 a day to 150-200 a day". Russo said access was still one of the major problems faced by humanitarian agencies trying to bring relief to the displaced. This week UNHCR had to stop distributing aid to the outskirts of Mogadishu because of the fighting and consequent insecurity on the roads. 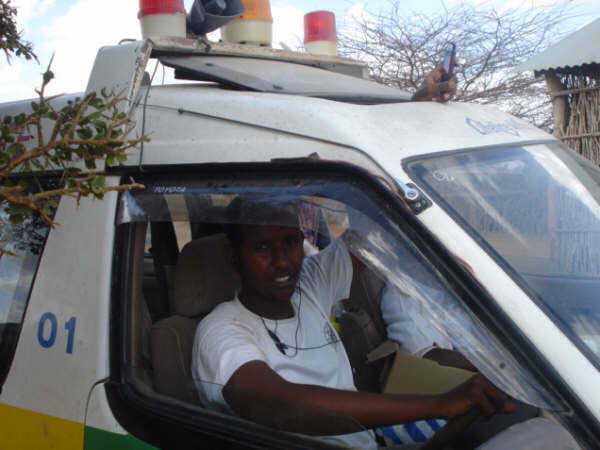 AMISOM patrols some of the roads to monitor security. AMISOM troops also protect the port of Mogadishu where the UN World Food Programme (WFP) is dispatching much-needed food aid. At the main berth, the cargo of MV Jaipur is being offloaded. It was hijacked by Somali pirates, but is now on duty again. From here, the food aid will be distributed across the country. Some three million people in Somalia depend on food aid. "Without the protection of AMISOM we couldn't do this work," says Abdi Yusuf, a government police officer in the port. The AMISOM peacekeepers also protect President Sheik Sharif Ahmed at Villa Somalia in Mogadishu, a multi-storey building in the heart of town. "I feel very safe here," the president said, but he called for more international help for his country. "We have an influx of foreign fighters who support the insurgents. If they manage to take over, it's easy to imagine what can happen next. So we are urging the international community to do more." A first step could be boosting AMISOM numbers. From the initially pledged 8,000 soldiers, only 3,400 were deployed by African Union countries. "So far we could not deliver the services to the people that we want to," said Maj Ba-Hoku Barigye, AMISOM spokesman. "Happily we understand that Ghana, Zambia and Malawi are close to contributing to the force." The UN Security Council’s unanimous decision to extend the mandate of AMISOM by another eight months could provide some breathing space.